The Steve Harvey Morning Show will be a part of Premiere Networks for the foreseeable future as the multi-media talent and the syndication company owned by Clear Channel agree to an “exclusive long-term agreement.” The deal will not only keep Harvey’s morning show with Premiere but will open new avenues within the Clear Channel Media and Entertainment operations for Harvey. Steve Harvey also recently helped launched The New 96.9 (WBZJ) in the Raleigh, North Carolina market that will feature the Urban AC format of R&B music. Also joining the Curtis Media station’s lineup are Premiere Networks' syndicated programs of Keith Sweat's night show "The Sweat Hotel" and Rev. Jesse Jackson's weekend program "Keep Hope Alive." New York -- January 15, 2013 -- Clear Channel Media and Entertainment, the leading media company in America with a greater reach in the U.S. than any other radio or television outlet, today announced an exclusive long-term agreement with top national radio personality, comedian, television host and best-selling author Steve Harvey to renew and expand his relationship with the company. Under the agreement, the multimedia icon will continue his current role as host of The Steve Harvey Morning Show, which is syndicated nationally by Premiere Networks on nearly 70 radio stations in the U.S., reaching approximately six million weekly listeners. Additionally, Harvey will work with Clear Channel Media and Entertainment on a variety of joint ventures including the international expansion of his top-rated radio program, development and creation of new programming and promotions, community and charitable events, as well as multimedia projects and events. He will also serve as a spokesperson for the company. "Steve is an unrivaled talent with success across multiple media platforms and we are thrilled to expand our partnership with him and collaborate on new opportunities to further drive business growth," said John Hogan, Chairman and CEO of Clear Channel Media and Entertainment. "As the leading media company in America, we continue to deliver the most relevant content and top personalities to diverse audiences across the country and Steve is a remarkable talent and incredible asset for Clear Channel Media and Entertainment." "It is my pleasure to be in business with the best!" stated Harvey. "My life has been an amazing ride, and when you can do business in a big way, it makes the ride all the more amazing. Clear Channel Media and Entertainment and Premiere Networks have been great partners. Mama, here come that Man!" Harvey was represented by his business partner Rushion McDonald for Nu-Opp Inc. and Attorney Ricky Anderson of Anderson & Smith P.C. during negotiations with Clear Channel Media and Entertainment. In September 2000, Harvey created The Steve Harvey Morning Show, which joined Premiere Networks' national lineup in 2005. Today, it's the number-one syndicated morning show in the top 25 metro markets with Persons 12+, Adults 25-54, Adults 18-34, Adults 18-49 and Women 25-54 (Source: Arbitron, FA'12, MSA, Exact Times, AQH T 25 Metros). Co-hosted by Shirley Strawberry, Carla Ferrell and Harvey's "Nephew Tommy," The Steve Harvey Morning Show broadcasts live on weekdays from 6 - 10 a.m. EST, and is also available on iHeartRadio.com and the iHeartRadio mobile app. For his work on the program, Harvey has received multiple NAB Marconi Award nominations. Advertiser demand for Harvey and The Steve Harvey Morning Show is at an all-time high. Blue-chip sponsors like Ford, The Home Depot, and State Farm Insurance partner with Harvey to reach his loyal audience on-air, online and at national events like the Neighborhood Awards, which celebrated its 10th anniversary in 2012, the Steve Harvey Mentoring Program for Young Men and more. In addition to his daily radio show, Harvey is currently hosting his third season of the long-running syndicated game show, Family Feud. His memorable reactions and hilarious rapport with the competing families have rejuvenated the series and have been widely praised, with ratings surging since his debut as the new host in September 2010. On September 4, 2012, Harvey debuted his new syndicated daytime TV show Steve Harvey, a one-hour daily program combining Harvey's humorous "everyday man" perspective and covering relationships, parenting, the workplace and a range of other topics. 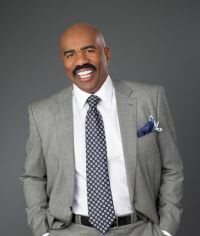 In its premiere season, Steve Harvey has been a phenomenon in all key rating benchmarks, and due to the program's instant success, it was renewed for a second season in national syndication in January 2013. Harvey was also recently awarded the 2013 People's Choice Award for "Favorite New Talk Show Host." Produced by Endemol USA and executive produced by Harvey, business partner Rushion McDonald, and showrunner Alex Duda, Steve Harvey is airing in 98% of the country, and being distributed by NBCUniversal Domestic Television Distribution. Harvey's first book Act Like a Lady, Think Like a Man - based on his popular "Strawberry Letter" radio segment - was released in 2009 by Harper Collins and became a #1 New York Times bestseller, selling more than 2.8 million copies worldwide and spending 64 weeks on the prestigious list. The hit Screen Gems/Sony Pictures Entertainment film adaptation of the book, Think Like A Man, debuted April 20, 2012 and topped the box office as the #1 movie in America for two weeks in a row. Starring Taraji P. Henson and Kevin Hart, it became the highest-grossing April release with more than $60 million in 10 days. In December 2010, Harper Collins released Harvey's highly-anticipated second book, Straight Talk, No Chaser: How to Find, Keep, and Understand a Man, which debuted at #1 on The New York Times Bestsellers list. With a wide range of fans from kids to adults of all ages, whether reaching people as a comedian, radio personality, author, TV host, actor, entrepreneur or philanthropist, Harvey remains true to making personal connections through faith, uplifting words and actions, and everyday life, all while sharing laughs and good times worldwide. For additional information, please visit www.SteveHarvey.com. With 239 million monthly listeners in the U.S., Clear Channel Media and Entertainment has the largest reach of any radio or television outlet in America. Clear Channel Media and Entertainment serves 150 cities through 850 owned radio stations. The company's radio stations and content can be heard on AM/FM stations, HD digital radio channels, Sirius/XM satellite, on the Internet at iHeartRadio.com and on the company's radio station websites, on the iHeartRadio mobile application on iPads and smartphones, and used via navigation systems from TomTom, Garmin and others. The company's operations include radio broadcasting, online and mobile services and products, live concerts and events, syndication, music research services and independent media representation. Clear Channel Media and Entertainment is a division of CC Media Holdings, Inc. (OTCBB: CCMO), a leading global media and entertainment company. More information on the company can be found at clearchannel.com, clearchanneloutdoor.com and ccmediaholdings.com.